A recent article by The Atlantic says that Americans spent $70 billion playing the lottery last year. Not $70 million, but $70 billion. 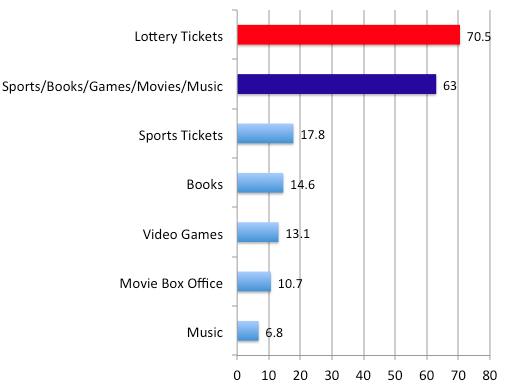 To put that figure into perspective, consider that Americans spent more money on the lottery than they did on books, video games, movie tickets, music, and sporting events combined. It works out to an average American adult spending $300 a year playing the lotto. This figure, of course, is in reality much higher since a lot of people don’t play the lottery at all. For instance, since the $300/year figure represents all Americans (both those who play the lottery and those who don’t), it would be true to say that for every American who isn’t playing the lottery, there is another one who spent $600 doing so. The study didn’t cite what the average lottery player actually spends annually, since these statistics are virtually impossible to collect, but we should be aware that the figure would actually be much higher than $300. What these stunning realities say to me is that we can quickly discover what the favourite god is in the Western world. Our favourite god is money. There are a number of levels to this issue. One is how the lottery helps to foster the cycle of poverty that exists in North America. According to the research, the most likely person to be playing the lottery is someone who can’t really afford it. As a person’s wealth increases, the less likely they are to be playing the lottery. In other words, while some people say they play the lottery for “fun”, most appear to be doing it as a desperate attempt to get rich. Or, at the very least, to escape poverty. Not surprisingly, however, the vast majority of those who play the lottery never win any significant amount, or often none at all, which only deepens their plight and reinforces a culture where the rich get richer and the poor get poorer. I’m not aiming to tackle this subject on that level, however. Mainly I am concerned with what this obsession with the lottery is saying about our own hearts, and how it is affecting us spiritually. Jesus spoke about money more than anyone else in the Bible. He did so because he knew that it was one of the greatest idols of his day. Apparently, not much has changed in 2,000 years. The god of wealth still rules the land, and his servants are willing to do whatever it takes in order for their god to bless them. What is truly sad is that the god of money can’t deliver what he promises. When people think about being rich, they immediately associate it with security, happiness, freedom, peace, and satisfaction. And while not having enough money to meet your needs can certainly rob you of some of these feelings, the truth is that none of the above are things that money can really offer – at least not in a permanent, deep-down-in-the-soul kind of way. Only God can do that. His point is that people must choose who their god is. Will it be money, or will it be God? We need to make this decision because, quite frankly, we can’t have them both as our god. It’s got to be one or the other. The person who aims to follow God but is in love with money is a person with a divided heart, and inevitably they are held back from truly pursuing God with their whole self. They are a slave to money, even if by choice. As such, it makes perfect sense why the lottery is as popular as it is. Everyone is searching for what only God can give, the security, happiness, freedom, peace, and satisfaction that comes from knowing the Giver of Life. But since money seems to deliver on these things in such a tangible, immediate, and visible way, we are falsely persuaded to go after it. And so, people clamour at the counter and hand over their cash in hopes of getting a bigger return. The lottery offers hope that is almost always beyond our grasp. How sad it is that we spurn the true God who offers true hope that is easily within our reach. Chasing after the lottery is a fools game. The lottery companies know it, and that’s exactly why they do it. They play on people’s fears and insecurities to get rich. The book of Proverbs, which aims to impart godly wisdom into people’s lives, warns against the desire to chase after riches. Get-rich-quick schemes are dangerous. They lead to us being “punished”, either as discipline by God or simply by the end result of our own foolish actions: we hand a person our cash and walk away with nothing. Even those who win the lottery are not in the clear. For one, money can’t save your soul from hell. Jesus said in Matthew 16:26, “What will it profit a man if he gains the whole world but forfeits his soul?” The rhetorical answer is, “nothing”. Those who actually win the lottery are not necessarily better off. In fact, sometimes winning the lottery can be a curse. It was that way for Jack Whittacker, who won a Powerball lottery of $315 million that was gone in just four years. He since said famously, “I wish I’d torn that ticket up.” And he is not alone, as there is a string of lottery winners piled up who blew their fortunes after hitting it big, apparently unprepared to manage their mountain of money. Americans would be better off, as Proverbs says, to “gather little by little”. In fact, if people would simply take the money they spent on the lottery and put it into a decent growth fund, they’d wind up with a hefty chunk of change later on down the road. For instance, using very conservative figures, a person who invests $50 a month in a savings account at 5% annual interest will, after 25 years, have doubled their investment of $15,000 to $29,456. In other words, it is wise to think long-term and save little by little, rather than play the odds of the lottery. But godliness with contentment is great gain,  for we brought nothing into the world, and we cannot take anything out of the world. But if we have food and clothing, with these we will be content. But those who desire to be rich fall into temptation, into a snare, into many senseless and harmful desires that plunge people into ruin and destruction. For the love of money is a root of all kinds of evils. It is through this craving that some have wandered away from the faith and pierced themselves with many pangs. This warning is sober. Playing the lottery, which is a strong sign that you desire to be rich, is causing you to get sucked into a trap that will cause you needless pain. Even worse, the love of money that drove those actions may cause you to wander away from God and lose your faith and your soul. May we take heed to such powerful words of caution! My friends, do everything you can to free yourself from the love of money. It is no god. It will not solve all your problems. In fact, it will probably make everything worse. Don’t get duped into believing that getting rich is the answer. It’s not, and never will be. Jesus alone is the answer. He alone can give you the wholeness of life that you desire deep down. He alone can satisfy. He can, and will, meet every need you have. Turn to Christ, and not to money, and pursue him. It is in this that you will find the joy and peace for your soul that you so long for. Let us free ourselves from everything that tethers us to this temporary world and soar to the heavens with the One who can save our souls. Great thoughts. Somewhere around 2008 I did a study on the lottery winners in the state of Oregon where I was a youth pastor. At that time, 75% of all winners who won $1,000,000 or more, were flat broke within in 4 years (50% within 2 years)! The numbers were staggering but illustrate the point that money isn’t the source of our issues (or else more money would solve our problems). This is a great post that puts the focus on money in the right place, on the giver of all good gifts, and that our hearts need to be in step with Him. Wealth and poverty should be viewed thru the same lens, and trying to hit the “jackpot” is a futile exercise. Great perspective, thanks Jeremy!